Great write-up by Paul Dorsey in today’s Nation newspaper for the Mekong Shadows anthology with praise for The Cambodian Book of the Dead. The anthology’s best episode, hands down, is actually a long excerpt from “The Cambodian Book of the Dead”, a taut and disturbing novel by Tom Vater (“Sacred Skin – Thailand’s Spirit Tattoos”). Rippling with clever wordplay, it’s a very dark reading indeed of Phnom Penh. Vater evokes “the smell of the tropics, saturated with reincarnation and ruin, this hypnotising combination of extremes, of promise and danger, of temptation and failure”. 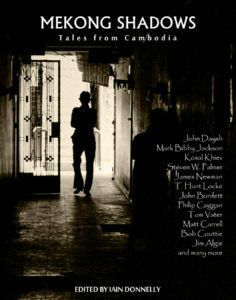 Mekong Shadows – A collection of short stories set in, or with connections to, Cambodia. There are tales of hope, of love, of despair, and even a sprinkling of black magic. Featuring stories from John Daysh, James Newman, Mark Bibby Jackson, Steven W. Palmer, Tom Vater, John Burdett, and many more.